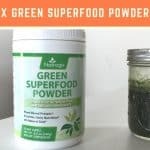 Home » Natrogix Green Superfood Powder Review — Solid All-Rounder? 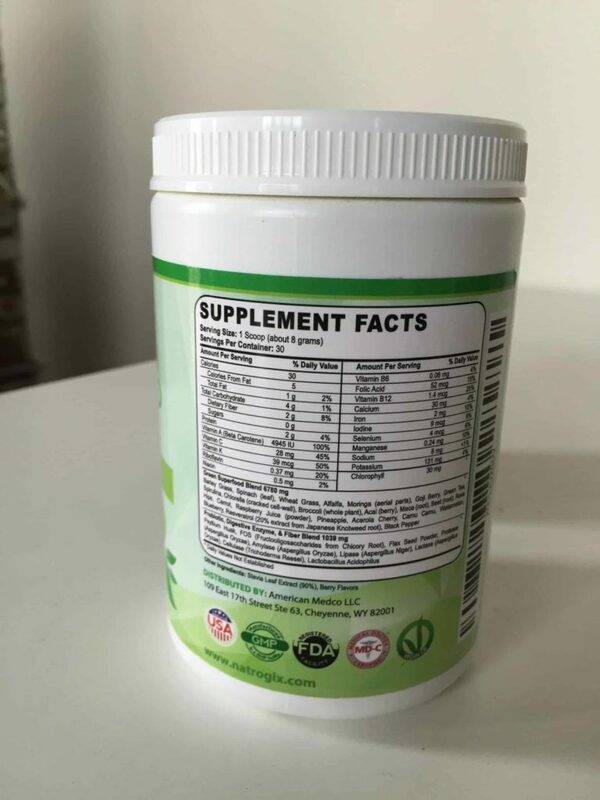 Natrogix Green Superfood Powder Review — Solid All-Rounder? Natrogix is a Wyoming-based supplement company that claims to help you achieve “nourishment as nature intended.” The company positions itself as an alternative health store and sells a lot of “natural” supplements like garcinia cambogia, ashwagandha, and cinnamon pills. Green Superfood Powder has refreshingly mellow marketing copy. Unlike some of its competitors, it doesn’t promise that it’s the only supplement you’ll ever need to take or that it can substitute for servings of vegetables. Instead, it says that it supports overall health, supports healthy immune and detoxification function, and helps achieve recommended daily servings of fruits and vegetables. So what’s in it? One serving has 30 calories from 1 gram of fat, 2 grams of protein, 4 grams of carbohydrates and 2 grams of fiber. The ingredients are separated into two categories: a Green Superfood Blend and a Probiotic, Digestive Enzyme, and Fiber Blend. The first category is the biggest. It has all the most commonly sought after ingredients in green superfood drinks like wheat grass, barley grass, alfalfa, spirulina, and chlorella. It also has quite a lot of fruit, from common species like raspberries and watermelon to more unusual fruits like acerola cherry, camu camu, and goji. The digestive health blend is a little light on probiotics — there’s just one kind, lactobacillus acidophilus — but it’s high in digestive enzymes. There are five kinds: protease, amylase, lipase, lactase, and cellulase. There’s also some psyllium husk and flax seed powder for extra fiber. Besides that, there’s just some stevia leaf and “berry flavors” for flavoring. The one thing that comes to mind the most when reading the ingredients list is “antioxidants.” These are ingredients with a ton of antioxidants, not just the greens but also the berries, green tea, and there’s resveratrol as well. Unfortunately, the product doesn’t quantify the antioxidant content. Some greens powders include their ORAC scale, for example, which is one way of measuring them. But even though this is missing from Natrogix’s powder, I’m fairly confident that it’s high in antioxidants. It also doesn’t include its probiotic bacteria count. We know that it contains lactobacilus acidophilus — only one type of probiotic, which isn’t great — but we don’t know how many it contains. This is a pretty big downside when you’re trying to work out if Green Superfood Powder will help your gut microbiome. However, it does contain a number of digestive enzymes which may improve digestive health and could help us draw more energy from our food. There’s even some lactase in there, which could make it a handy product for people with lactose intolerances. Finally, one of the most interesting things about this product is its detailed nutrition label. Yes, there’s no probiotic or antioxidant information but there’s a lot of info about the micronutrients. This is surprisingly rare in the greens powder industry. We know this product has about 50 percent of your daily Vitamins C and K , 100 percent of the daily Vitamin A, 25 percent of your daily B12 and about 10 percent of your daily iron, folic acid, and manganese. I liked this, especially for the price. A tub of 30 servings costs just $20, or 66 cents per serving. In my personal experience, that’s one of the cheaper green superfood drinks on the market. Compare that with Athletic Greens ($4.23/serving), Onnit’s Earth Grown Nutrients ($2.30/serving), Patriot Power Greens ($1.96/serving), Emerald Balance ($1.30/serving), Vitamineral Green ($1.16/serving), Green Vibrance ($1.08/serving), ORAC-Energy Greens ($1/serving), PharmaFreak Greens Freak ($1/serving), MacroLife Naturals Macro Greens (72 cents per serving), Sun Warrior’s Supergreens ($0.55/serving), and Amazing Grass’s Green Superfood ($0.52/serving). It’s berry-flavored and tastes pretty pleasant. It’s similar to Cytogreens or Kylea: earthy, but with enough blueberry flavoring that it’s pretty nice to drink. You can still tell it contains seaweed, but it’s far better than a lot of the bitter, soil-like greens powders on the market. 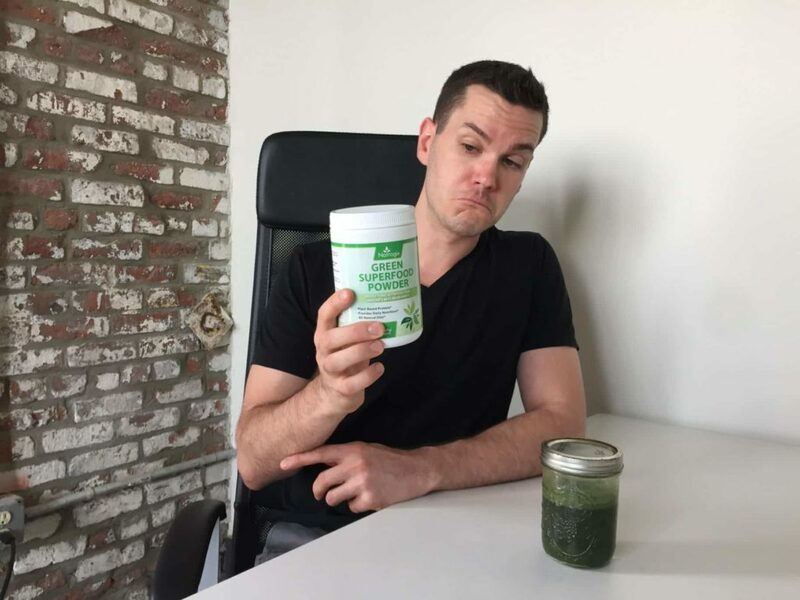 There’s nothing mindblowing about the nutrition content of this product but for the price, Natrogix’s greens powder seems like it could be a solid choice. It helps contributes to your daily intake of micronutrients and antioxidants, it may improve digestion, it’s cheap, and it’s tasty. I would have liked more probiotics and perhaps more adaptogens, but for this price I can’t complain too much.